The clothes a person wears tells us many things: their status in life, for example, or their cultural affiliation or identity. They can tell us what era they live in, and even a person’s current state of mind or intent. Understanding how to describe clothing in a story well will help you create fuller, richer character portraits. Think of your characters’ clothing like an actor’s costume in a play. The costume is a large part of the character. As soon as the actor enters stage right or left, we have an inkling of whether they’re a wealthy landowner or peasant, an elegant heiress or down-to-earth flower-seller. What the description shows is that many of the invitees play at status and refinement through fancy dress. Yet Dr. Urbino’s status as a respected doctor is earned – he has nothing to prove by dressing smarter. Thus his plain dress is, ironically, a sign of his greater status. Like Marquez, you can compare and contrast character’s clothes to reveal important details about their social status or position. You can quickly convey a number of things about your characters based on the clothing they wear. You can also confound or prove untrue impressions your characters (or readers) form based on appearances. A wealthy character might dress ostentatiously in expensive clothing. But they could also dress in modest, inexpensive-looking clothes. What would you think about a wealthy character who looked as though he shopped at thrift stores? Or one who was forever wearing poorly-fitted clothing that appeared to be handed down from friends? These detail could suggest that your character is miserly or down-to-earth despite their wealth. Dr. Urbino in Marquez’s example above fits the latter category. Think of other interesting combinations: A teacher who dresses provocatively; a beggar with an incredible, fashionable style of dress: What backstory or character motivations could these combinations of position and appearance suggest? A few small details of clothing can radically separate your characters, highlighting aspects of their personalities. The Victorian author Charles Dickens is widely regarded as a master of characterization, for good reason. His clothing descriptions are always precise, often comical. The pompous and bullying Gradgrind is (as Dickens’ descriptions elsewhere show) the type who’d wear a waistcoat concealing an eyeglass for catching people out. In one single piece of clothing description (‘a pink-eyed bundle of shawls’), Dickens conveys how timid and ailing Mrs. Gradgrind is in contrast to her bullish, overbearing husband. Why this arguably works better is the details of getting dressed tell us multiple details about Gem. The last minute change suggests an indecisive nature. We see the contrast between the character’s friend’s reaction and the advisory words of Gem’s aunt. The fact Gem goes with jeans and a tee could suggest that she trusts her aunt’s advice, or else feels shamed by her Aunt and compelled to be ‘good’. There is simply more characterization, not only of Gem but the other example characters. Embarrassed by her own inability to dress in finery for the occasion (and by being upstaged), Katerina resorts to scathing mockery of Amalia. Like Dostoyevsky, think how something as small as a character’s change of clothing can affect their own or others’ behaviour. Another important function of clothing description in stories is to create an authentic sense of time and place. Particularly in genres such as historical fiction and fantasy, clothing can help to create other worlds (or a long gone era of our own). Mantel creates a vivid sense of the wealth that the church amassed in these times. The fact the clothes ‘seem to stand by themselves’ indicates just how heavy they are with jewels and embroidery. The details create an authentic sense of a prominent cardinal’s dress in the 1500s. Elsewhere, Mantel’s novel is full of descriptions of garments for specific, era-appropriate purposes: Riding cloaks, town coats, and other clothing people of means would have worn at this time. Similarly, find out (or, if you’re creating a fantasy world, create) the garments your characters would wear in a particular time and place, for a particular purpose. Describe these in passing to add visual colour and authenticity to your character descriptions. Ready to sketch vivid characters for your novel? 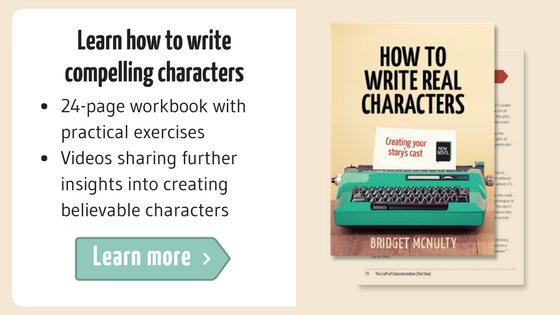 Use the ‘Character’ section of the Idea Finder to flesh out your story’s cast.